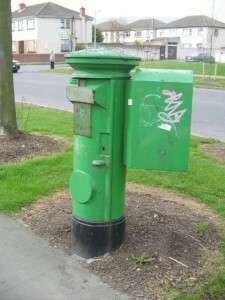 I have to laugh when I see a Post Box like this one because they always remind me of when I used to go to school. 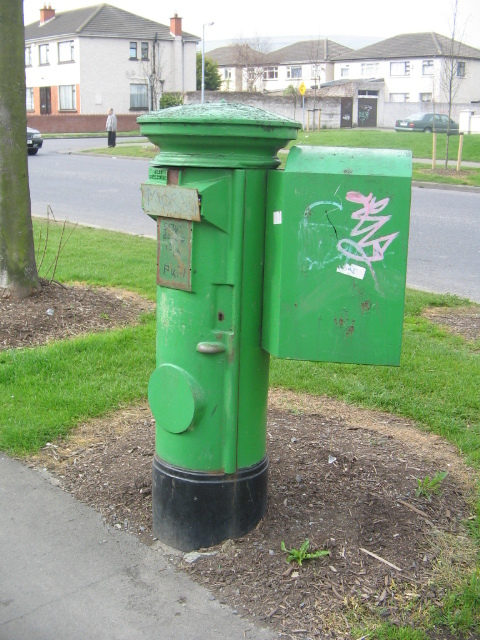 I always think the Post Box has a school bag on it’s back like we used to have. I remember one day coming down the road from Saint Finbar’s school and I thought I was in the Foreign Legion or something with the big bag on my back. The Ma’ was standing at our hall door and saw me. When I got to our gate she says ‘What’s in that bag’? ‘Me school books Ma’ says I. Well if she didn’t make me empty everything out onto our path. There was my English Reader, my Irish book, my Algebra book, two copies and my pencil case. Then the rest came out. There was a Tomahawk made from an old tin can and a piece of stick, a two foot length of rope for a Lasso, six Conkers with no strings, a big piece of Wicklow granite that I thought was a piece of silver (I found that up near the dump), a dead Frog that I found up at the Silverspoon, a bit of a broken Hurly Stick that I used as a rifle, a piece of broken chalk and some mouldy bread from a sambitch that I got in Finbar’s. ‘Holy mother of God…’ says the Ma’ as she raised her eyes up to Heaven. ‘…where did you get all that rubbish from’? ‘That’s not rubbish Ma’, that’s all me stuff’, I told her. ‘You’ll get stuff alright when your father comes home’ she said but she always said that and yet she’d never tell the Da’ on me. I started putting all my goodies back into my schoolbag when she says ‘Here, throw that oul rock over there into the compound’ ‘But Ma’ that’s a piece of real silver that I found up at the dump’. ‘I’ll give you silver…’ she said. ‘…do you want me to end up in the Gorman or what’? Well I knew there and then if the Ma’ ended up in the Gorman I’d get no dinner so I threw the rock away.